I haven’t written any code with the Reactive Extensions for a little while, so much so that I’d forgotten how much fun it can be. I got a ping from Javanie on Twitter about some code that he was a bit blocked on writing which needed to call the MovieDb API and the particular problem was in the way that the API provides paged results of data back to the caller. What was nice about this was that the code he sent me was using RestSharp and he’d already done the work to create the right classes to serialize the results which come back from the service so I had only to do a bit of work in order to try and get those pieces to plug in nicely into Rx. I snipped out most of that JSON but the important bit is that it contains an array of results and it also contains a total_pages and total_results so it’s possible to figure out how many pages are required and by appending a page parameter to the query string it’s possible to request each of the pages. and so the task became one of how we might use a bit of Rx in order to make a web request to get back the GenreCollection from the service and then find the “Action” genre and then make some more web requests in order to get back all the movies. For each movie on that page extract some detail of that movie. It’s very procedural when we hit the “loop” parts of that logic and the trick (if there is a trick) is to perhaps think of that looping in terms of sequences rather than loops. One of the “interesting” parts of this piece of code is when the HTTP request is sent to the service. That is – is it sent after line 1 above executes or is it sent as the subscription starts on line 9 onwards? In the Rx terminology that’s the difference between a “hot” observable and a “cold” observable. In this case, without that call to Subscribe on line 9, no HTTP request is sent to the service. It’s produced “on demand” which is probably what I want. 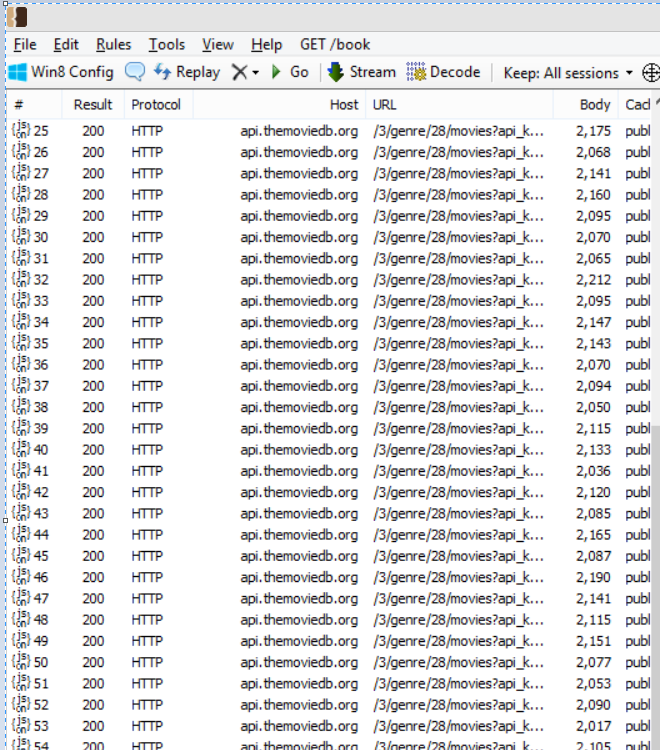 Having got the ability to make a web request, I can now call the API to get hold of the id of the genre relating to “Action” movies and I can then grab the first page of data back from that web request to figure out how many pages of data there are in total. // likely to only be one of these in reality. // identifies itself as "Action"
and so now, we’ve managed to produce a sequence of integers (probably a sequence of 1) which relates to the total number of pages of data available in each of the genres that identifies itself as “Action”. 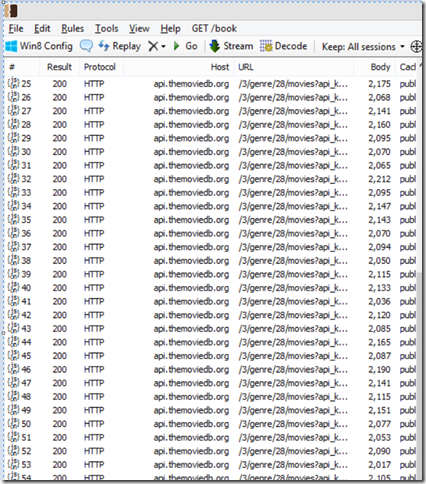 It takes a bit of head-scratching to try and conjure up a way to go from this sequence containing the total number of pages to a sequence of HTTP calls which return pages of data but it’s not too bad. We have functions like Enumerable.Range() (or Observable.Range()) which can produce a sequence of integers for us so that could be use to produce page numbers 1…N where N is the total number of pages available. // data, pass it along as part of the sequence. and that produces a nice output to the console of (1, N), (2, N), (3,N) … (N,N) with the next step being to produce a set of web requests for each of those pages in order to get the actual movie data. // gets the data for that particular page's movies. and so now we end up with a sequence of MovieResult which is being pulled from each web request that we make to the service with 1 request bringing back multiple movie results. that’s quite a lot of HTTP requests! The order in which requests come back is also somewhat random. For instance, each time I run this code I can find a different movie returned as the first movie which might not be what I’m looking for. Back on line 42 of that previous code snippet I’m using the SelectMany operator to go from a sequence of anonymous types (containing a page number and a MovieCollection) to a sequence of MovieResults. The way in which that is done though is to produce an IObservable<MovieResult> for each of the input sequence and each of those IObservable<MovieResult> is produced by doing an asynchronous web request to get that particular page of details from the web service. The ordering in which those web requests might complete is not deterministic and so it’s possible that the second web request completes before the first one and so movies from the second page of results are produced before movies from the first page of results and so on. I think that’s the nature of the SelectMany operator – it takes an IObservable<T> and for each T it runs some function to produce an IObservable<U> which means that you ultimately end up with a set of IObservable<U> and values of type U are going to be produced by those observables as and when they are available. the return type of this function is now IObservable<IObservable<MovieResult>> – it’s a sequence of sequences because it is no longer being flattened for me by SelectMany. Then the movies are consumed in the order in which they appear in the web service results starting at Page 1, Movie 1 and only moving on to Page 2 when we’ve exhausted Page 1.
and the request for page 2 goes out once page 1 has been consumed. I’m sure that I did some things wrong but I had a lot of fun putting together that little bit of code. Rx is such a great framework to work with – I wish it was more built into the .NET framework pieces as I’d love to see it show up in app development for Windows/Phone – e.g. rather than firing an event from the UI why not just have a sequence of data flowing from the UI. Naturally, you can always plug Rx in but it’d be great to see it natively part of more framework pieces.